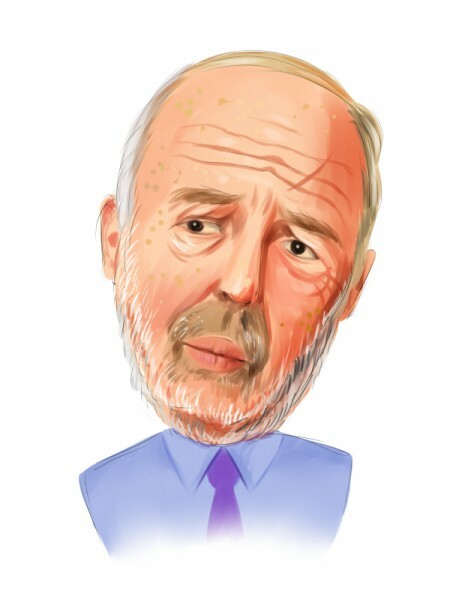 Did Hedge Funds Drop The Ball On Wayfair Inc (W) ? Is Wayfair Inc (NYSE:W) worth your attention right now? Investors who are in the know are getting less bullish. The number of bullish hedge fund positions retreated by 2 recently. Our calculations also showed that W isn’t among the 30 most popular stocks among hedge funds. Let’s take a glance at the recent hedge fund action regarding Wayfair Inc (NYSE:W). How have hedgies been trading Wayfair Inc (NYSE:W)? At the end of the fourth quarter, a total of 28 of the hedge funds tracked by Insider Monkey were long this stock, a change of -7% from one quarter earlier. 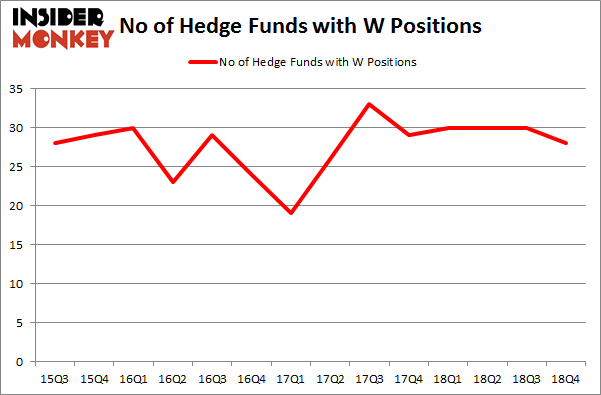 The graph below displays the number of hedge funds with bullish position in W over the last 14 quarters. With hedgies’ sentiment swirling, there exists an “upper tier” of notable hedge fund managers who were boosting their holdings considerably (or already accumulated large positions). More specifically, Spruce House Investment Management was the largest shareholder of Wayfair Inc (NYSE:W), with a stake worth $337.8 million reported as of the end of September. Trailing Spruce House Investment Management was Adage Capital Management, which amassed a stake valued at $263 million. D E Shaw, Renaissance Technologies, and Scopia Capital were also very fond of the stock, giving the stock large weights in their portfolios. Since Wayfair Inc (NYSE:W) has witnessed a decline in interest from the aggregate hedge fund industry, it’s safe to say that there were a few hedgies that slashed their full holdings by the end of the third quarter. Intriguingly, James Crichton’s Hitchwood Capital Management said goodbye to the biggest position of the “upper crust” of funds followed by Insider Monkey, worth an estimated $88.6 million in stock, and Israel Englander’s Millennium Management was right behind this move, as the fund dumped about $22.5 million worth. These bearish behaviors are intriguing to say the least, as total hedge fund interest dropped by 2 funds by the end of the third quarter. Let’s now review hedge fund activity in other stocks similar to Wayfair Inc (NYSE:W). We will take a look at LINE Corporation (NYSE:LN), Snap-on Incorporated (NYSE:SNA), American Financial Group (NYSE:AFG), and ANGI Homeservices Inc.(NASDAQ:ANGI). This group of stocks’ market caps are similar to W’s market cap. As you can see these stocks had an average of 20 hedge funds with bullish positions and the average amount invested in these stocks was $291 million. That figure was $1440 million in W’s case. American Financial Group (NYSE:AFG) is the most popular stock in this table. On the other hand LINE Corporation (NYSE:LN) is the least popular one with only 4 bullish hedge fund positions. Wayfair Inc (NYSE:W) is not the most popular stock in this group but hedge fund interest is still above average. This is a slightly positive signal but we’d rather spend our time researching stocks that hedge funds are piling on. Our calculations showed that top 15 most popular stocks among hedge funds returned 21.3% through April 8th and outperformed the S&P 500 ETF (SPY) by more than 5 percentage points. Hedge funds were also right about betting on W as the stock returned 66.4% and outperformed the market as well. You can see the entire list of these shrewd hedge funds here. Is Macy’s, Inc. (M) A Good Stock To Buy? Here’s What Hedge Funds Think About Discovery Communications Inc. (DISCK... Wolf Hill Capital’s Q1 2019 Investor Letter Here’s What Hedge Funds Think About HollyFrontier Corporation (HFC) Did Hedge Funds Drop The Ball On Melco Resorts & Entertainment Limited... Were Hedge Funds Right About Flocking Into HEICO Corporation (HEI) ?